Thea Voogt is a Senior Lecturer at the TC Beirne School of Law, specialising in taxation law, corporate governance law and corporations law. Thea is a chartered accountant, holds a Doctorate in Financial Management and Master of International Commercial Law (UQ). Thea is an award-winning law teacher. She is the 2017 recipient of the prestigious UQ Business, Economics & Law Faculty Teaching Award for her innovative, student-centred, technology-driven collaborative approach to teaching the law to commerce students. She received the 2016 'Insprired me to learn' Award for Teaching Excellence in an undergraduate compulsory course at the TC Beirne School. She was also awarded the 2015 Award for Teaching Excellence in an undergraduate compulsory course at the TC Beirne School of Law. The impact of Income Tax Law on small businesses, small business restructure, succession planning and the taxation of discretionary trusts. Small firm and small family firm business structures, focusing on family farming and regional businesses. Corporate governance theory and the duties, roles, responsibilities and skills of directors in listed companies. 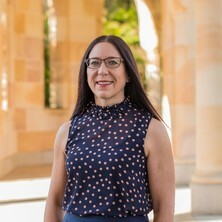 Thea is the Research Program Leader for Governance, Science, Technology and the Law at the Australian Institute for Business and Economics: https://aibe.uq.edu.au She is also a Fellow of the Australian Centre for Private Law. Prior to joining the University of Queensland, Thea was Professor in Accounting and the CEO (Principal Officer) of the superannuation funds of the University of Johannesburg, where she also managed large tenders for that institution. Over her career in South Africa, she was closely involved with the South African Institute of Chartered Accountants as researcher, presenter, guest speaker, umpire and question setter for the national qualifying exam for chartered accountants. Thea was a ministerial appointment to the Board of the South African Qualifications Authority (SAQA), and served on the board of the Southern African Accounting History Centre. The taxation of small businesses in Australia is extremely complex and lacks policy consistency and direction. Income tax often plays too large a part in business structure decisions. Marked differences exist between small business profits, taxable income and business owners’ access to business-generated cash. Family firms are ubiquitous in Australia, but no tax policy exist for family firms. This project uses evidence-based research to develop small business and family firm tax policy, and business restructure and cash flow strategies. The project focuses particularly on small businesses and farming in remote, rural and regional Australia, partnering with RAPAD (www.rapad.com.au), the peak regional economic development body for Outback Queensland in the Central West of the State in a three year pilot study entitled: The impact of business form and access to cash on Central West Queensland primary producers and small businesses: RAPAD region policy solutions, scalable rural economic development and business innovation. In Australia, the vast majority of listed company boards are made up of independent non-executive directors. Their legal obligations are no different to the position of a director in a private company, but their participation in the day-to-day operations of the company is very different. On the basis that the decisions of listed company directors are focused on strategy and risk, and on the direction of the corporation and its culture, what skills should the directors have? How do they fulfil their legal obligations if they are not present and involved in the day-to-day activities? Thea's research focuses on small businesses and their business structures and fills an important gap in multi-disciplinary research in Australia into small firms and family businesses. As part of a five year project, Small Australian firm business stuctures, Thea is conducting a longitudinal pilot study of small businesses in the RAPAD-region of Central West Queensland. RAPAD is the peak regional economic development body for Outback Queensland in the Central West. The RAPAD-region spans the seven local government areas of: Barcaldine, Barcoo, Blackall-Tambo, Boulia, Diamantina, Longreach and Winton. Central to the pilot study are family farms and the integration between family farms and town businesses in this agriculturally focused and small firm dominated region. The pilot study also involves the development of best practice for rural financial counselling services working together with RAPAD as project partner, as well as remote, rural and regional economic and tax policy development that impact Outback Queensland. Small Australian firm business structures is a collaborative project between Prof Ross Grantham (TC Beirne School of Law, UQ), Prof Martie-Louise Verreynne (UQ Business School) and Dr Thea Voogt. Voogt, Thea (2018) A conceptual assessment of board skills in ASX100 companies. Australian Business Law Review, 46 218-236. Voogt, Thea (2017) Tall trees and digital literacy: Lessons from Palkon v Holmes. Australian Journal of Corporate Law, 31 3: 344-369. Journal Article: After all the talk, what is the Turnbull government actually doing for small business? Stiglingh, M., Hamel, E.M., Venter, J.M.P., De Clercq, B., Howell, R. and Voogt, Thea (2003). Belasting op Toegevoegde Waarde. In 'n Studentebenadering tot Inkomstebelasting (pp. 1-67) Durban, South Africa: LexisNexis Butterworths. Hamel, E. H., Stiglingh, M., Venter, J. M. P., De Clercq, B., Howell, R. and Voogt, T. L. (2003). Value-added tax. In A student's approach to income tax: business activities (pp. 1-67) Durban, South Africa: LexisNexis Butterworths. Voogt, Thea (2017) Articulating care, skill and diligence standards for non-executive directors. Company and Securities Law Journal, 35 2: 128-148. Voogt, Thea (2011) The effects of the global financial crisis on Top 40 CFOs. Journal of Economic and Financial Sciences, 4 2: 367-390. Audit committee responsibilities vis‐á‐vis internal audit: how well do Top 40 FTSE/JSElisted companies shape up? Steyn, Dirk A., Voogt, Thea L. and Marx, Ben (2007) The engagement decision in medium audit practice in South Africa. Journal of Economic and Financial Sciences, 1 2: 171-184. Rob Jurd and Thea Voogt (2004) Behavioural finance – a valuable supplement to classical financial theory. Research Journal of the Department of Accountancy, University of Johannesburg, 9 10: 31. Koorts, Johan and Voogt, Thea (2004) Dividend Policy and the Value of a Company. Research Journal of the Department of Accountancy, University of Johannesburg, 9 10: 16-16. Voogt, Thea (2002) Academic Autonomy Versus Government Intervention - a Financial Perspective. Research Journal of the Department of Accountancy, University of Johannesburg, 8 9: 21-21. Thea Voogt (2002) Practical suggestions for successful tender procedures. Research Journal of the Department of Accountancy, University of Johannesburg, 6 7: 22. Thea Voogt (2001) Governance in institutions of higher education. Research Journal of the Department of Accountancy, University of Johannesburg, 7 8: 3. Sander, Korien and Voogt, Thea (2000) The Use of CoBIT in Small and Medium Size Accounting Firms to Identify CIS Risks. Research Journal of the Department of Accountancy, University of Johannesburg, 6 7: 29-29. Thea Voogt (2000) The role of IT governance in corporate governance. Research Journal of the Department of Accountancy, University of Johannesburg, 6 7: 22. Voogt, Thea (2019). Income tax and trust law perspectives of the practical disregard of legal form in discretionary family trading trusts. In: Australasian Tax Teachers Association conference, Perth, Australia, (). 16-18 January 2019. Voogt, Thea (2016). Articulating care, skill and diligence for non-executive directors Master's Thesis, T.C. Beirne School of Law, The University of Queensland. Voogt, Thea (2015). Directors' statutory duty of care and diligence in the context of information technology Master's Thesis, T.C. Beirne School of Law, The University of Queensland.